I’m tired of everything that’s unruly and jumbled within me. If I could just figure out how to get the pieces of my life to fall into place, God would get on with what He has been waiting to do and show me what’s next. The Bible says that God began a good work in me when He saved me from my sinful self, and He will be faithful to complete it. My lack of faithfulness must be derailing His efforts. He can’t do what He wants to do until I figure out what’s wrong. I wonder if what God says in the Bible about His activity in my life is true? Perhaps it’s true for others but not for me. In less than a minute, what I thought was just a simple observation morphed into a runaway train of doubt. It only took one bit of subterfuge to set the train in motion. It took two days before I derailed it. As the firstborn of two firstborns who married a firstborn and became the parent of a firstborn, I’m intimately familiar with perfectionism. I’m really good at measuring my self-worth by what I’m able to do. This is how my faith has been warped by the enemy. He has whispered over and over again that it’s up to me to get the pieces of my life in order before God will let me join Him in what He’s doing in the world. The words of Isaiah stand in stark contrast to this lie. The prophet declares that God’s purpose will stand and He will do all that He pleases (Isaiah 46:10). That doesn’t leave room for me to get in His way by not being good enough. He will use whoever He wants whenever He wants to do whatever He wants that will bring Him pleasure. Still, it's not easy to let Someone else arrange the rack. Do you struggle with believing it's all up to you? I'd love to hear your story. Great post! 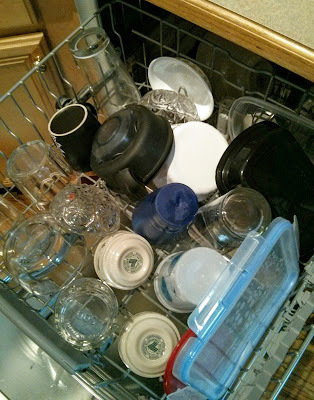 Excellent comparison of the dishwasher and your life. I think I'm right there with you! Wonder Woman, I am Not?